By Harry Rowland: Tony Bellew has bitten off more than he can chew with this one, as David Haye trumps him in speed, power, strength, size, height, reach, weight, skill and experience. The only two attributes in Bellew’s favor are age and activity. At 34, Bellew is only 2 years younger so this doesn’t count for much. What does count however is the gap in recent activity. This factor is the one thing Bellew and his fans are clinging to as the only hope of an upset. During Haye’s inactivity over the last few years, Bellew has been plugging away and improving as a cruiserweight, whilst competing in world class company. Haye has been back in action for over a year now, albeit against two handpicked heavyweights that haven’t managed to provide 3 full rounds workout between them. All of this becomes irrelevant when considering the huge gap in talent and physical attributes between the fighters. Haye has still been active and in training for well over a year, and knows himself well enough to know how to prepare correctly. Haye will be too fast in his defenses for Bellew to form any sort of sustained attack. His superior footwork and head movement will cause Bellew fits. Add to this the speed of Hayes offense and its hard to see anyway of Bellew having a hope of connecting with any regularity. Haye will also be able to jab over the top of Bellew’s to nullify him getting anything set up. The other major factor will be the disparity in power, yes, Bellew has power and this could carry to Heavyweight, but Hayes power is on another level. Bellew’s only hope is To make it a rough fight, taking it to Haye and turning it into a war where he might be able to land a left hook on the chin. This tactic would need to involve Haye obliging to a slugfest, which he doesn’t need to, and at this stage of his career isn’t foolish enough to. Despite Hayes comments he will be taking this fight very seriously and looking to cautiously set up a clean finish. This is a mismatch, a manufactured money fight and the only people to blame for it’s occurrence is the UK boxing fans. If there was no interest in the fight then it wouldn’t be happening. David Haye would probably be fighting New Zealander Joseph Parker for the WBO title, instead of Hughie Fury. After beating the unheralded Mark De Mori and Arnold Gjergjaj, Haye was curiously ranked as the number one contender for the belt. Due to public interest there was more money on the table to fight Bellew, and the belts can wait. It also gives Haye the opportunity to get some much needed rounds in, should Bellew turn out to be harder than expected. You can’t blame Bellew for pushing for this fight either, as it is by far the biggest money fight available to him and the biggest of his career so far. In defeat he can go on to defend his WBC Cruiserweight belt against his mandatory challenger. On paper it is a no lose situation much as it was for Kell Brook to step up and fight Gennedy Golovkin, unless you are a fan of course. This fight is a bit of history repeating itself for Haye, another domestic rival that he will be paid handsomely to dispatch within 6 rounds at the most. Back in 2010 Audley Harrison was the fodder and Haye made no bones about the ease of the task at hand then, as he is now. 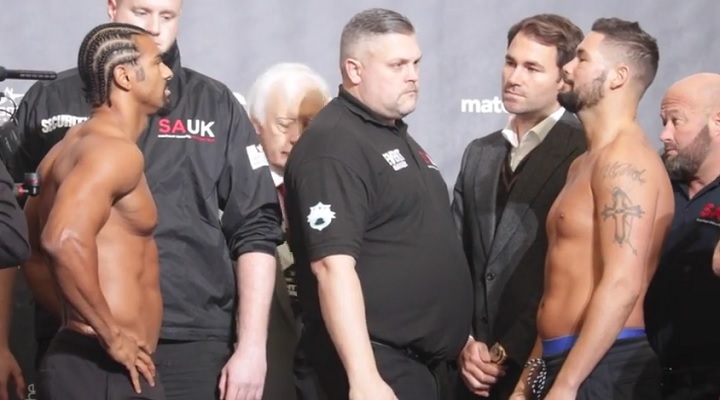 The Harrison fight not only let the fans down but also derailed the UK pay per view model at the time. Despite Bellew being a natural Cruiserweight, he poses more of a threat than Harrison did, for this reason I think Haye will be keen to get him out of there as soon as possible, which I predict will be some point in the 2nd round. Davies is quite rightly an overwhelming betting favorite in this one. He is unbeaten and has looked solid in his career so far, he is on the up having just stepped up in his last appearance, shutting out the capable Andrea Scarpa over 12. Matthews on the other hand is nearing the end of his career and coming off a stoppage loss to Luke Campbell. Add to this that Matthews is stepping up a division to Super Lightweight. Matthews will struggle to close the distance against the rangy Davies, when he does he will find his opponent will be punching harder in the exchanges. Due to Davies’ long limbs he doesn’t like to fight on the inside, so Matthews can cause problems if he can take the fight to his foe. Should he manage such a feat it will likely take more out of Matthews than Davies, and I see him getting broken down as the fight goes on and possibly being stopped late. I expect Matthews to make it to the final bell as Davies is lacking the killer instinct of Campbell at this stage of his career, he has looked very patient in recent fights which isn’t a bad thing. Davies to win a unanimous decision. You could be mistaken for comparing this match up to that of Davies v Matthews, but the major difference is that Eggington although more experienced than Davies, is not as highly touted in talent, and Malignaggi has lifted world titles at two weights, whereas Matthews has fallen short at world level. Despite this I see the same outcome. Coming off a stoppage win over domestic rival, and very tricky Frankie Gavin, Eggington has huge momentum and at 23 is still very fresh. Malignaggi has too many miles on the clock to counter Eggington’s relentless onslaught. It won’t be pretty but it will be an entertaining fight for as long as it lasts. If he isn’t completely shot and taken out early as he was against Shawn Porter, I can see Malignaggi using his wily skills and experience to hang on to the end. Eggington to take a unanimous decision.